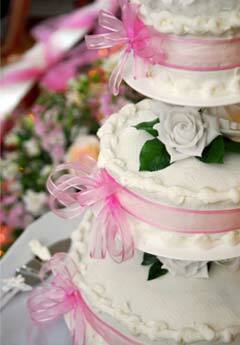 Buttercream wedding cakes are best known for their unforgettable and mouth watering frosting. The texture of buttercream icing is so smooth and creamy, it's reminiscent of marshmellows melting in your mouth after it has been in a cup of hot chocolate. Just the thought is giving me tingles! Buttercream frosting or fondant frosting? If you love cakes like I do and about to decide on your wedding cake, your mind will be in a jumble and you'll be undecided. So do you pick the all time favourite and appetising buttercream cake or the latest wedding cake fad rolled fondant cakes? 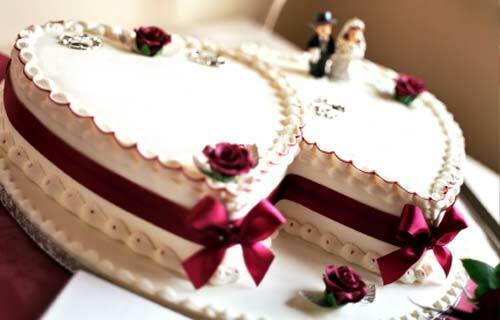 Feast your eyes on these scrumptious wedding cake pictures. 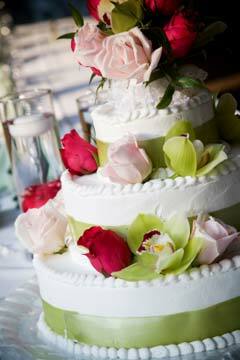 Buttercream wedding cake designs suitable for casual and formal weddings. A stunning and classic white two level wedding cake with pastel coloured rose. 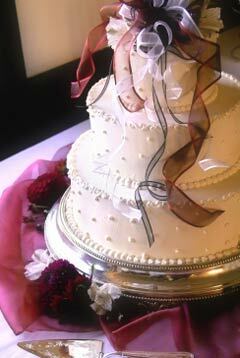 A delicate three tier burgundy and white themed wedding cake. A three tiered wedding cake with tropical green cymbidium orchids complimented with lovely ribbon and light and dark pink roses. A white five tier buttercream cake decorated with squiggles and scrolls and complimented with accents of yellow rose petals and wrapped with white ribbon. 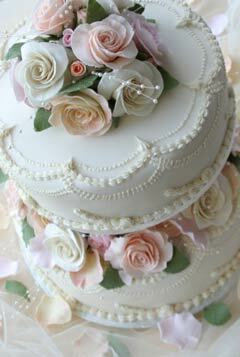 Hearts are a lovely shape for a wedding cake. This cake is embellished with rich dark red ribbon and accents. These hearts represent two hearts beating as one. 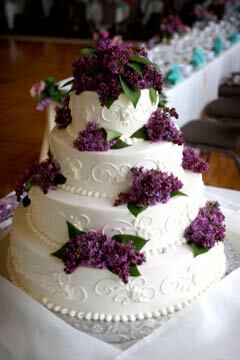 A classic and stunning four tier wedding cake for a purple and white theme wedding. Three single tiered white and pink themed cakes on a three level cake stand. Great for the budget conscious. 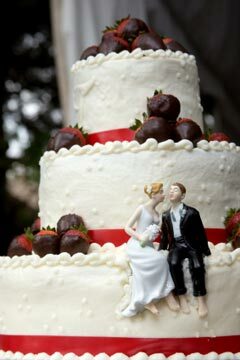 This white and red three tiered buttercream cake is decorated with chocolate coated strawberries, red ribbon and a very cute bride & groom topper. A simply stunning white three tiered huge wedding cake. Adorned with orange and pink tiger lillies. Buttercream Cake or Fondant Cake? If you really want a buttercream cake and you also love the look of rolled fondant designer wedding cakes, you can have both. 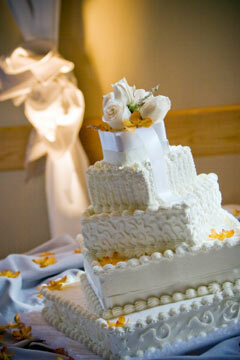 Choose buttercream and have your wedding cake designer roll a thin layer of rolled fondant frosting over the top. The fondant layer gives your buttercream cake the perfect base so the wedding cake designer can create more intricate designs and details. 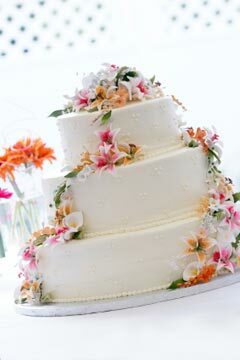 Your wedding cake will not only be appetising but will look gorgeous too.